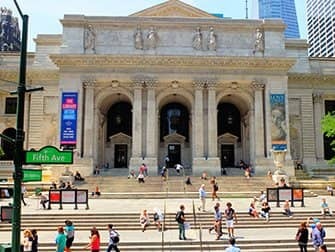 The Public Library in New York is located on the corner of Fifth Avenue and 42nd Street. The building is known for its beautiful interior. Besides the worthwhile visit to the building, there is free internet and computer services are also available. 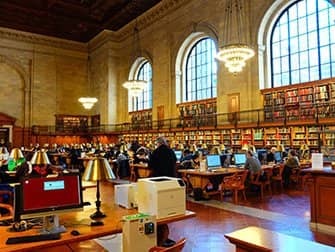 The Public Library New York is the second largest public library in the US. It is spread over several locations, of which Bryant Park is the most famous and impressive. The imposing building with it’s high ceilings, grand staircases and mysterious halls is definitely a nice place to pop in to if you are in the neighbourhood. 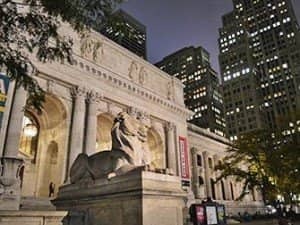 The library is ‘guarded’ by the two stone lions; Patience and Fortitude who stand at the entrance. Free access to MS Office. Registration required as a visitor to use the computers. Do not forget your ID.